Huntington Marina Online | Enough! See below the copy of a letter I sent to Debra Guzman of Lordon Management re: the hypocritical and reprehensible behavior by some board members. I’ve had enough of these wannabe dictators thinking they can do what the hell they please because they are sitting on the board. My point is simple: we are not morons and we can make our own decisions without being told what to do! HMA is not Leisure World or an apartment complex and we are all free and independent homeowners! I want to bring this to your attention. Today (8/9/16) around lunch-time, I was surprised to see a flier stuck on my entrance door with blue duct tape. 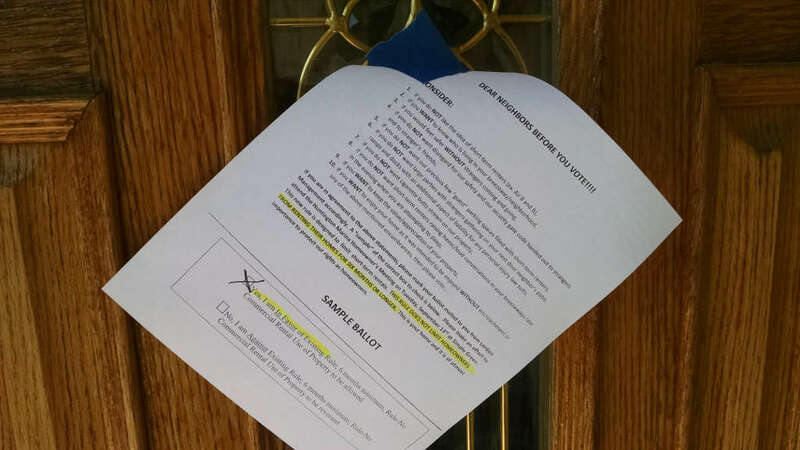 Since I had heard footsteps in the breezeway, I ran out to investigate and found (and confronted) Rick Huizenga (a board member) and Larry Campbell (an HMA homeowner) going door to door, gluing fliers on private property. Upon inspection, I discovered that the fliers are anonymous and purport to influence homeowners’ vote on the 6-month lease rule. See attached photos. In my recollection, there was an incident last year where anonymous fliers were distributed in a similar manner (except they weren’t glued to the doors!). This caused the board to widely chastise whomever did it. And now, they do the exact same thing! That’s just hypocritical, not to mention plain wrong. Rick Huizenga is a board member and his actions in this matter cannot be dissociated from his functions. I hereby call for his immediate resignation for conduct unbecoming a board member. The board has already messed up the initial iteration for this so-called “6-month lease” rule and now they use dubious methods to make sure the membership votes their way, after having wasted thousands of dollars in legal fees for a measure that is all but worthless! Why worthless? Because the City of Huntington Beach already makes it a misdemeanor to rent for periods of less than 25 days, with $1,000 fine per occurrence AND jail sentences for repeat offenders. AND they have access to the DA and the cops! What more do we need? See City Ordinances 204.10, 210, 210.04, 230, 230.42, 3.28.02, 3.28.030, 3.28.080 and 17.10.050. In my opinion, the board should spend more time and energy managing the maintenance of this complex and less behaving like the mini-dictators of a banana republic! Please advise the board that it is not well-received by people to be told what to do, particularly via an anonymous flier glued to their door. What a distasteful disgrace! What this board does not understand – since they obviously cannot see further than the tip of their noses – is that multi-billion dollar corporations like AirBnB and VRBO are actively pursuing legal avenues (for example suing the City of Anaheim right now) as well as lobbying state legislatures in these matters. So, after they have won or settled expensive lawsuits with municipalities that are unfavorable, they could easily turn to HOAs that have renting rules in excess of what the cities allow. And they can easily drop millions on a nationwide lawsuit, the outcome of which will apply to 1,000s and 1,000s of HOAs. This makes it cheap for them as the prospective combined revenue is enormous. What we would do then? Pay VRBO and AirBnB exorbitant ransoms because our little board wanted to flex their legal muscle? That’s plain stupid. 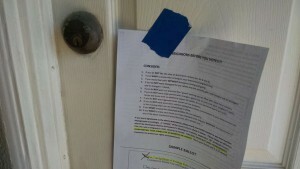 Let the City of HB defend us and let us abide by and help them enforce their perfectly reasonable rental rules. Finally, I am entitled to the quiet enjoyment of my property and this includes not having anonymous fliers glued to my door by board members trying to strong-arm me into supporting their failed decisions. If anyone wants to contact me, they can send me a letter using the US Post Office and pay for the stamp! to this message by anyone else is unauthorized. If you are not the intended recipient, any disclosure, copying, or distribution of the message, or any action or omission taken by you in reliance on it, is prohibited and may be unlawful. Please delete the message and immediately contact the sender if you have received this message in error.